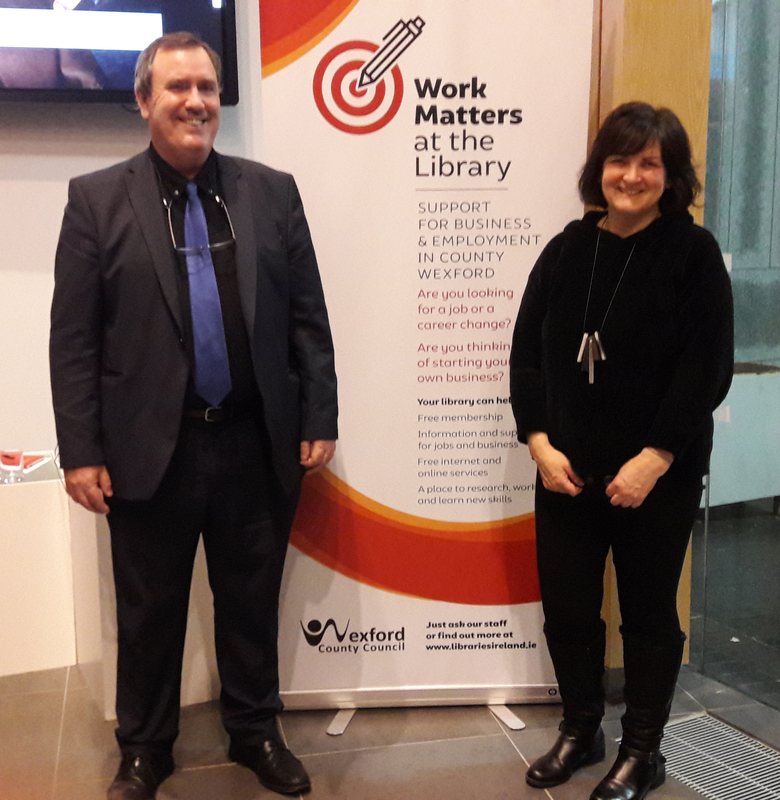 The inaugural WorkMatters Startup Meetup networking event took place in Gorey Library on the 5th February. Brendan Fitzpatrick founder of Global SCM Solutions and StartupJourney.ie shared his knowledge, practical advice and expertise on how to start and run your own business. It was also a valuable networking event for everyone who attended. There are pros and cons of starting your own business. Two of the main advantages are that you are your own boss and work your own hours. However, the stability and regular income of having a full-time job are just some of the factors that must be weighed up before making that final decision. It really depends on your own personal circumstances as to which path you decide to take. For your business to be viable Brendan emphasised that your product or service must solve a problem. Your customers must be willing to pay for it. Otherwise, it can turn into a hobby. Building relationships, planning and being your authentic self can help you to make the right connections. Brendan spoke about his experience of sending emails to people and asking them to meet for coffee to have a chat about his business. He was pleasantly surprised by the high number of positive responses. He joked that they even paid for the coffee. Other important tips were to always be alert, read the newspapers, listen to the news and to the people around you. Keep a notebook and pen handy as you never know when an idea or a solution to a problem might pop into your head. Brendan keeps his notebook on his bedside locker at nighttime just in case he gets an idea in the middle of the night. Start Your Own Business Relief provides a 2-year exemption from income tax (up to a maximum of €40,000 per year) for people who have been unemployed for at least 12 months (312 days) before starting their own business. If you are long-term unemployed you may be able to claim tax relief to start your own business. Female High Fliers is an accelerator programme for Ireland’sbest early-stage startups, specifically addressing the challenges facing female entrepreneurs. The Local Enterprise Office (LEO) is the First Stop Shop for anyone seeking information and support on starting or growing a business in Ireland. There are various startup events happening in The Hatch Lab, Gorey such as Techstars Startup Weekend from 1st to 3rd of March 2019. Read what happened last year. You can contact them directly for more information about this and other events. The next WorkMatters Startup Meetup networking evening will take place on Tuesday 5th March at 7pm in Gorey Library. The topics to be presented and discussed will be business supports and programmes that are available for startups and small businesses through LEO Wexford and the New Frontiers Programme Entrepreneur Development Programme. The two invited speakers are Breege Cosgrave, Senior Development Adviser, LEO Wexford, and Eugene Crehan, Director of Programmes, CEDRE, School of Business, Waterford Institute of Technology, who also manages the New Frontiers Entrepreneur Development Programme for WIT. Looking forward to seeing you then. You can book your place by phoning Gorey Library on 053 942 1481. The WorkMatters initiative hosts a series of business and employment events which includes practical talks to support business start-ups, job seekers and to help kick start your career. The WorkMatters Startup Meetup network events are organised and facilitated by Catherine Duggan, founder of CollaborateTogether.